A dresser and mirror combination is more than just a functional piece of furniture. Either a dresser or a mirror can add so much more to a room. With our combination sets, or singling out just the dresser or mirror, these useful pieces can become the focal point of a bedroom’s décor. 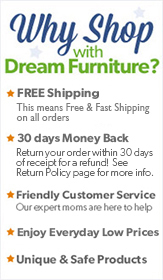 With so many styles, colors, finishes, and details to choose from, DreamFurniture.com offers you the highest quality dressers and mirrors that will last for years to come. Just the thing to make a bedroom feel like home.